Pictured above: Students with Miami Music Project, a grant recipient of The Jorge M. Pérez Family Foundation. The Jorge M. Pérez Family Foundation at The Miami Foundation fulfills the philanthropic vision of Jorge M. Pérez, chairman and CEO of The Related Group, and his family to develop South Florida as an exemplary world-class urban center. The family foundation promotes sustainable, inclusive and just communities by supporting programs and organizations focused on arts and culture, health and well-being, education, environment and economic development – with a particular preference for programs and organizations that could serve as models for other urban centers. To support the launch of a Miami Diaspora Commissioning Fund, being created to build partnerships with multi-cultural artists who live in Miami or artists who share Miami’s view of the world, annually spending up to $100,000 on exceptional creations that connect Miami internationally. A Master Artist Residency, beginning in 2019, that will invite renowned artists from around the world to work alongside younger local and national studio residents. To expand the organization’s internship program, which will enable the organization to offer paid internships in the arts for more than 100 students per year – compared to the 300 they have been able to provide over the last six years. To expand low-income residents’ access to the organization’s suite of affordable loans that help individuals and families meet short and medium-term capital needs and gain financial independence, without resorting to triple-digit products like payday and auto-title loans. To build sustainability for this national model of statewide grassroots mobilization and advocacy that is achieving greater awareness, programs and resources for Florida’s most vulnerable children. To increase the organization’s climate change education and outreach work to meet demand for more trained individuals in its speakers’ network, to expand its Resilient Women + Girls pilot program – which connects climate change, health and financial preparation for more severe weather event, and to expand its Climate Trainings that educates and engages a broad range of sectors and individuals in the community. To expand the Nutrition Education Program in public schools that trains teachers – and provides curriculum and grocery allocations – who then provide lessons and hands-on cooking instruction to children in grades K to 8 to improve their nutrition and healthy eating behaviors – and those of their families. To expand the organization’s work to use artists and art to engage and connect residents to the arts and each other, and build greater Miami’s national and international reputation. To build the program foundation, partnerships and talent base for Coconut Grove Playhouse’s theater-in-residence. To support the organization’s building of homes to revitalize struggling neighborhoods in Miami-Dade through affordable homeownership opportunities, with a Fiscal Year 2019-2020 goal of building 35 single-family homes, which will be purchased, with an interest-free mortgage that Habitat provides, by low-income families in the program. To launch Miami KIPP’s proven model for student success, which includes an extended academic day, social supports and intensive leadership development for all staff. The KIPP Sunrise Academy in Liberty City will enroll 220 students for 2018-19 and is projected to grow to roughly 500-600 by Fall 2021. To support expansion of the Learning Center for Children – a model inclusion program of children with and without visual impairments – as it grows from 40 to 60 children. 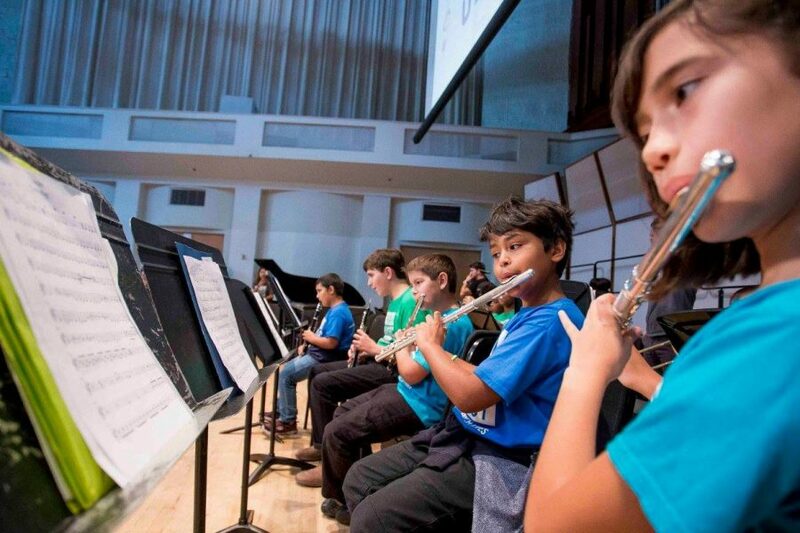 To support MMP’s 10-year strategic vision and 5-year capacity building campaign to expand its signature Children’s Orchestras Program from four to 12 neighborhoods, towards the goal of making the program accessible to every at-risk child in the county. To support the development of educational touring programming, expanding its reach, audience and influence beyond the Colony Theatre – where it is the resident company and venue manager. To expand the organization’s education, engagement, research and advocacy work to improve the resiliency of Greater Miami’s wastewater system infrastructure and water quality of Biscayne Bay. To advance the company’s growth toward being an orchestra that is both innovative in presenting classical music and a model for how orchestras and classical music thrive. To support the organization’s programs that use the power of arts to advance the healing of patients with diminished cognitive skills and other infirmities at the organization’s six facilities. To support the capital campaign to develop the Liberty City campus with dormitories for all students to live and learn in 24 hours a day, five days a week, and support the specialized staff the school needs – beyond the scope of public fund allocations – to ensure students have the best possible opportunities at SEED and beyond. To provide start-up capital to build an independent Support Team working with six neighborhood-level Community Coalitions to create greater awareness, programs and resources to reduce youth violence. To expand the organization’s Office Hours program, currently in pilot phase, and increase availability for business owners/entrepreneurs from low-income communities and participation opportunities for expert advisors.